This October Emma Donovan & The PutBacks have brought together some very special guests to release a new 7” single featuring two classic Aboriginal Australian songs. Emma is joined by Tim Rogers of You Am I and rapper Joelistics on a version of Warumpi Band’s 1985 anthem Blackfella Whitefella and by Archie Roach on a deep soul rendition of his late partner Ruby Hunter’s heartbreaking hit, Down City Streets. All vinyl includes MP3 download code. If you’re outside Australia, the Buy Vinyl button will find a store close to where you live – automagically! This release supports the massive grassroots movement led by SOS Blak Australia, an organization dedicated to supporting Aboriginal communities in remote Western Australia currently under threat of closure. Earlier this year SOS Blak Australia issued a worldwide call to action to stop these closures occurring. In response to this, Emma and all the artists involved have come together to declare that they stand with the Indigenous people of Australia in support of their right to self-determination on their traditional lands. All involved have donated their time free of charge and all proceeds from the record go to SOS Blak Australia. Blackfella Whitefella, the country rock epic written by George Rrurrambu and Neil Murray in 1985, feels more relevant than ever 30 years on. 2015 is, in so many ways, becoming a critical year in relations between Aboriginal Australia and the broader community. When the Prime Minister labeled Indigenous communities living on traditional lands a “lifestyle choice,” which he refused to support, he touched a nerve and tens of thousands of Australians from all backgrounds were soon marching in protest. Simultaneously, on sporting fields and across the media, Indigenous athletes have taken a stand against racism from fans and commentators and once again, Australians of all backgrounds stood up in support. This song asked long ago for Australians of all colours and backgrounds to “stand up and be counted,” for all of our rights. This year the call is being answered. Written by Archie’s wife Ruby Hunter, who passed suddenly in 2010, for his debut album, Charcoal Lane, Down City Streets tells hard truths of Indigenous urban disadvantage. Emma and The PutBacks have put a deep, sweet soul groove under it and Emma and Archie revisit the song as a duet, sharing verses and singing the choruses together. It’s both a sad and hopeful song, mirroring Archie and Ruby’s personal journeys from struggle to security and success. It’s also a fitting companion to Blackfella Whitefella, linking the experiences of bush and city life and a testament to the disconnection experienced when Indigenous people’s remaining links with family and country are severed. 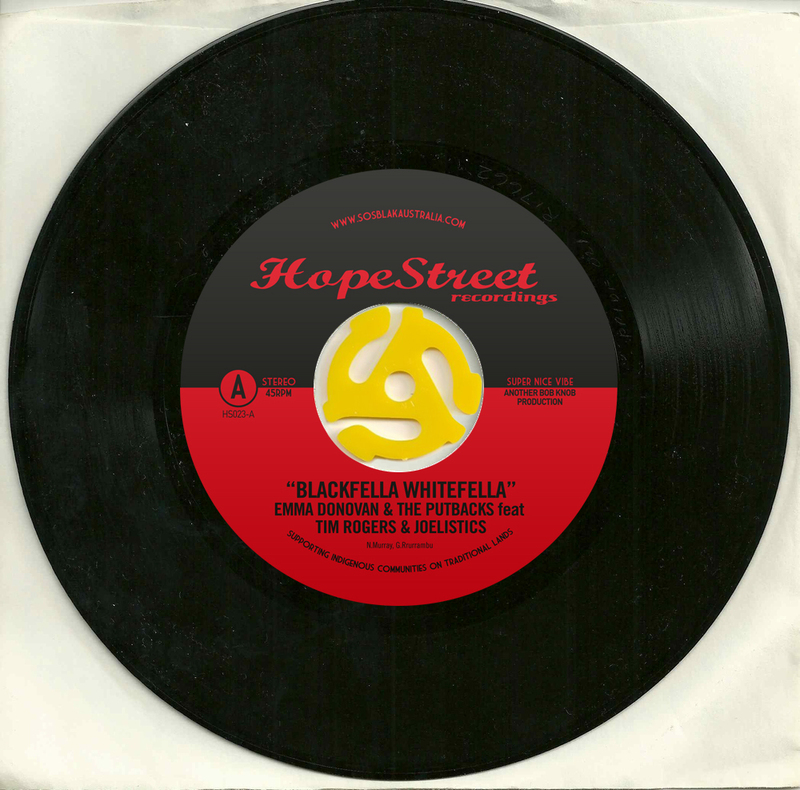 Blackfella Whitefella b/w Down City Streets is available on 7” vinyl and digital from HopeStreet Recordings from October 23rd and all proceeds from the release will be donated to SOS Blak Australia. See below for more information on SOS Blak Australia’s campaign to protect remote communities of the Kimberly region.